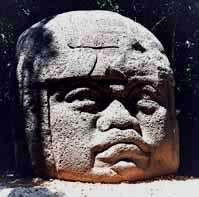 LIVING STONES OF THE MAYA - Are you a Living Stone? Many years ago, while in Tikal, I was awoken before dawn. I had an intense calling to go into the jungles of Tikal before sunrise. As I walked into the jungle, misty clouds clung to the trees. The first predawn light filtered through the jungle canopy giving a surreal feeling. I could hear the first bird awakening and calling in the day. It was wonderful to be in the site free from the tourist buzz. I thought I was going to the main plaza of Tikal, but instead I was drawn toward another path leading me toward the north. I kept following my heart until I came to a standing stone. I could feel it call me. I sat behind it and placed my back against its back. As I did this, I was filled with grief, and yet, a deep remembrance entered my heart. The rest of the history of the Living Stones came back to me. But before I get ahead of myself, maybe I should start at the beginning . . . The Ancient ones (a.k.a. The Star Elders), over eons of time, have worked to find ways to anchor a highly rarified form of universal, spiritual light on the Earth. This light ignites the evolution of all life. They wanted to anchor this light to keep the Earth from going into total darkness during various predictable "dark" cycles. The dark cycles are necessary for evolutionary advancement and act like a womb to birth new and more advanced cycles of time on the Earth. Without this light, we would have ended up like the Moon or Mars. While in these dark cycles, Earth is in a state that we might see similar to a planetary comma. During these "dark" cycles, it is not possible to let this type of rarified light out into the planet, since it would accelerate the darkness, as darkness is the dominant force during these times. So this light was anchored so it would not be totally lost; it was locked away for safe keeping until the planet woke up from its catatonic state. This anchoring created little threads of light that keep the planet tied to the universal source of all that is. After this was done, all they could do was wait for the "dark" cycle to end before releasing this light once again into the world. The ancient ones anchored this rarified light in many ways over eons of time. Long before any recorded history, Star Beings anchored this rarified light in stones that are part of a universal living library. We know these stones today as the "Stones of Ica". You can still listen to them in a little museum just south of Lima, in Peru. Later on, Andean Masters had the ability to hold this rarified light in living mummies. They still speak to you if you have the ears to hear them. They are scattered all over the Andes. The Egyptians locked this light in ones that had obtained a certain level of advancement. They locked them body and soul in magnetically sealed pyramids and tombs to hold the light there. The most tangible and easiest way to experience this rarified light is in the Maya lands. Over the last 20 years, I have had the blessings to spend time in all the major Maya sites and many smaller sites. I feel that Palenque and its surrounding area, Tikal and its area, Copan and Quirigua, and the mystical valley between these two, to be the most vocal of the Maya areas. 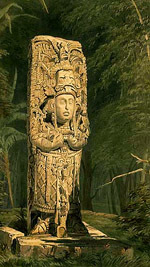 Many of the Living Stone Stela (carved standing stones) speak about different things for different reasons. They can hold maps of consciousness, maps of the universe, spiritual knowledge, sacred geometry, advanced technology (like time travel and immortality), and some keep doorways open for us to use to travel. This is just the tip of the pyramid by the way. There is much more for us to uncover. Why this is important to you now . . . So getting back to that morning in the jungles of Tikal . . . some of the history that was shared with me, I can pass onto you now. I have been holding onto this information for 9 years. Because of the events that transpired during our last trip to Tikal, I now I feel that I can share the rest of the story. As I sat in the mist with my back to this living stela, I began to have a conversation with an old friend in the stone. I could feel his pain, joy and wisdom. It felt like what he told me happened yesterday, but it didn't. It happened a long time ago. He began to tell me things that I had forgotten, and maybe things that you forgot as well. The Living Stone said . 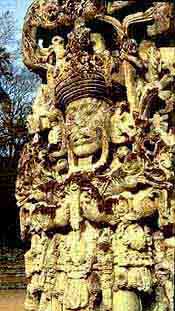 . . "There came a time in Tikal's ancient past that one of these planetary dark cycles was expected very soon. It was time to hide away the light and the ancient knowledge for a future time . . . that which you are entering now. We knew that it was going to get really messy, and we didn't want the light to be misused to accelerate the dark cycle. Europe was already in the dark ages. We (Star Elders) had held this cycle at bay for a time, but it was spreading across the ocean like a virus, and it was too close for our comfort. We were going to have to leave, because we too hold this rarified light that can not be present in a living form during a dark cycle." I was shown the intense focus, effort and deep spiritual practice it took to anchor their souls in a stone while retaining all the knowledge, wisdom and light that they carried. The Living Stone said . . . "Once you were ready, your soul was anchored into the stone by means of a ceremony of sorts. *** While focusing upon the stone that you had prepared for yourself with great care, you were swiftly, but cautiously released from your physical body, while you projected your consciousness into the stone. If you failed, there was no turning back, because your body was gone. If this happened, you had to reincarnate. This is a great loss, because when you reincarnate, you lose much of the wisdom and basically have to start over. Hundreds and hundreds of these brave advanced souls were lost in this way. They were my friends. . . and this still makes me sad. But the victory was that many did indeed anchor their souls in the stone for a future time." I asked the Living Stone, "How did it feel when you entered the stone?" As he shared the story, I got a chill to the bone that had a huge d�j� vu vibe to it. This sounded familiar, and I bet it will give many of you out there the same feeling. The Living Stone said . 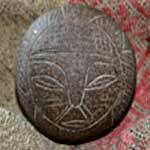 . . "When you enter the stone, you still feel alive, as if you were still in your body. This is why it is so important when you pass away that you leave your body and go through layers of cleansing and clearing, so you forget what is was like to breathe and move in physical form. Also, so you forget your wounds and most everything, so you can start fresh and clean in the next life." He went on . . . "But when you anchor yourself in a stone, you can not breathe and can not move. I felt like I was drowning, but I could not die. You know what I mean . . . that split second of utter terror just before you reach the surface of the water to breathe. I couldn't move either, causing me the feeling of pain because I was getting stiff. You stay in that terror and pain for years! We volunteered to do this. It was our choice out of service and love. We wanted to do this. We knew what we were signing up for . . . BUT I don't think we had any idea how horrifying it would feel at first. It was hard to adjust to." The Stone continued . . . "Years later, when we became accustomed to being 'alive' in a stone, we could relax and enjoy the view from the angle that we entered the stone. First thing that I noticed was that time is different in a stone. The grass grew right before my eyes. The sun would come up and go down in what feels like an hour for you. By this point, the site had been abandoned for some time. But once in awhile, someone would go by and look at me. I would try to speak to them but they could not hear me." The time difference made great sense to me. I know that the longer I sit in a site, the more I can hear. This is why we are called to sit atop a pyramid and just be there. The Stone heard me thinking . . . "RIGHT YOU ARE! If you move through a sacred site too fast, you are just a flash to us. You have to stay in at least an hour or more in one spot for a stone to see you at all. It takes time to make a connection, so we can converse." The Stone shared . . . "Everyone became quite lonely. In the loneliness, we had time to watch and map the stars, and watch the cycles for the time that we could live outside the stone. If the stone you were in fell down, face first, it was a real disappointment, as we could not watch the stars and life on Earth any more. It was just dark. Archeologists have now set some of these stones back upright again. What a blessing! But some of us were placed facing the wrong direction. There was a great importance to the direction that we faced." I asked "If your body was gone, how could you come out to live again? What would your physical bodies look like?" I quickly learned that a very small part of each soul was sent out to reincarnate during this anchoring ceremony. This small part of yourself would reincarnate over and over and have no memory of the light that was anchored in the stone. This insured that you would have yourself, a body, to come back into. This way the light in the stone would be safe until it was time to come out. I asked the Living Stone "How would this small part know how to find you again?" The Stone shared . . . "All these little parts of ourselves were set up on a cosmic time clock, and when the alarm sounded, we would feel an intense urge to search for something that was lost. In this searching, once the body gets close enough to the light in the stone, the body will have a download . . . a great spiritual awakening. This is a life changing moment." Then I asked a question that is so important to us now . . .
"If you were a living stone, or had a connection with a living stone, how will it feel when we get a download from a stone?" "Aside from the blissful spiritual awakening and feeling like you have purpose once again (this topic to be discussed later in an entire book; not an article), many strange and sometimes un-diagnosable health issues seem to arise. Because you are stuck in a stone, alive for hundreds, maybe thousands, of years, it causes a memory of being in that stone that sometimes is a part of the download you receive. The Star Elders had not anticipated these issues. Much of the training went into getting into the stone, and most didn't pay much attention about getting out again." Are you a returning Living Stone?
" Feel weird stiffness, aches and pains in the body for no reason that massage and other treatments seem to fail at helping?
" Breath shallow or have trouble with asthma and sudden allergies?
" Have frightful dreams of being alive, but everyone around you thinks that you are dead?
" Have claustrophobia and dislike closed in spaces?
" Have issues about being heard by others or find that you are too loud?
" Have a sudden need to completely shift your life?
" Have strange events in which time lines feel different?
" Have trouble finding home or maintaining deep relationships?
" Have a strange attraction to stones or live in a place with a lot of rock? If this feels like you, and you feel you might be one of these beings who have begun the download process, just knowing this story can help you overcome the issues of re-entry quickly. A simple re-entry process . . . Call in Archangel Michael. Ask him to assist you in filtering the effects of the download. Ask that the memory of being alive in the stone is filtered out. Ask that everything you brought with you and placed into the stone, and all the things you learned while in the stone, can be brought forth into current memory in your physical body. This filter looks like a house screen that you keeps bugs out of your house. But this screen is like being inside a beach ball of screen. Ask that this screen be put in place around you through . . . All time, space and dimension . . . Past, present and future . . . Body, mind and spirit . . . 7 day a week, 24 hours a day, 365 day a year. Every time you go to a place where your symptoms seem to get worse, tighten up the screen, so it filters out more. Sometimes re-entered ones can feel the effect of a sacred site quite physically, and this can be uncomfortable. Empaths feel what the INCA MASTERS call Kausay Pacha (cowz-eye pah-chah) a world of living energy. Sensitive ones are known as QAWAQ (cow-wak) or seers of living energy. Empaths feel Taripaypacha (tah-ree-pie-pah-cha) with means we encounter the entire universe. It is also a word that refers to a new golden era. It is known as the age of meeting ourselves again, and heralds coming together again of the people, and the recreation of a new and better world. Are YOU are a part of this emerging world?